Argent... a building services company dedicated to 'making buildings work'. Vehicle livery is one of the most public facing aspects of Argent's brand. Just days after hitting the streets Argent were receiving calls from potential clients. Short run literature, designed and written for specific markets enable Argent to present their business to a range of audiences in a consistent and compelling way. 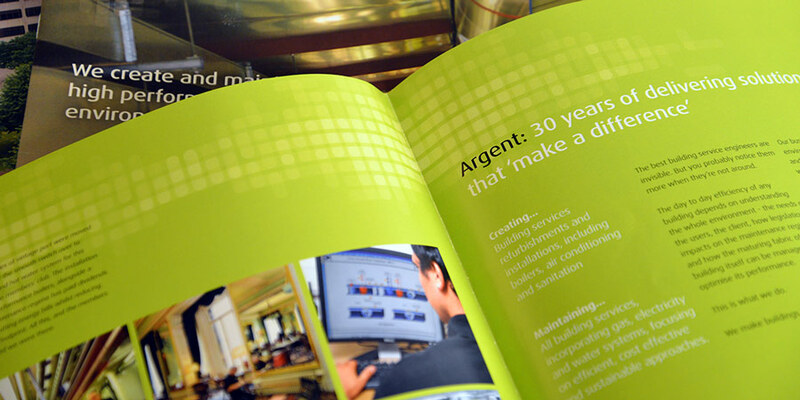 We devised a flexible and targeted approach to Argent's markets. Argent's content managed website is easily updatable with monthly news which can be integrated with e-bulletins. We re-branded the business from root to branch, across all media as well as advising them on tendering strategies. We prepared design and content templates, building a library of content that enables them to compete credibly with larger organisations. This new approach has improved their success with tenders by 90% and Argent’s new business performance is now transformed. Clients and assessors comment on the quality and presentation of our documents. The van livery certainly gets noticed, which is a great advert for us. Even the engineers like the new black and lime green uniforms. What Day1 have managed to do is to take us through a number of fundamental changes, which not all of us were convinced about the need for. But it’s certainly true that the outcomes have silenced the sceptics!